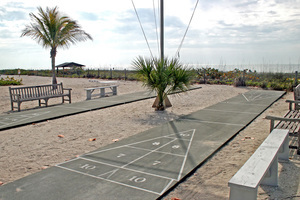 Shuffleboard has been played in Florida since about 1913. It dates back centuries to a game of sliding large coins. Photo courtesy of Lee County Shuffleboard Club. Mere rumors of a breeze waft through the open air Clearwater Shuffleboard Club on a spring morning as Florida’s best shufflers push discs, eyeball strategic moves and tabulate scores. Discs schussed across courts clink, clack and clatter when they collide. At times forceful shots clobber another disc with authoritative clunk, and sometimes discs veer off courts with thunks into the alley, shuffleboard’s version of bowling’s gutter. Shufflers, as they’re called, are here for the Tournament of Champions. They’ve come from Estero, Fort Myers, Cape Coral and Port Charlotte to participate against counterparts from around the state. 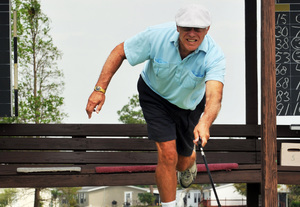 Unseen by those of us outside the sport, shuffleboard is booming in Florida, with thousands of men and women playing. 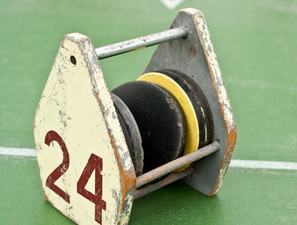 “Shuffleboard is making a big comeback,” says Dave Kudro, first vice president of the Florida Shuffleboard Association. The sport’s vitality is evident on this sunny morning that Kudro is to speak at the Clearwater championship―license plates in the parking lot from Lee, Broward, Pasco, Manatee and Pinellas counties, snowbirds from New York, Illinois, Ohio, even the distant Canadian provinces of Ontario and Quebec. “The elite of the elite play in this [Clearwater] tournament,” says Landy Adkins, president of the Florida Shuffleboard Association. Friendship and camaraderie are among the game’s draws. But at its heart shuffleboard is still a sport. It’s in human nature to want to excel and compete and, even for players easing past 80th and 90th birthdays, those desires may be tamped down a bit but they haven’t been extinguished. The Rev. John E. Brown, 80, of Bradenton, for instance, is hardly a novice, playing the game for “72 2/3 years,” tracing his shuffleboard roots to July 1946 as a boy in Kentucky. “What other sport can you play from [ages] 5 to 105?” Brown asks. Lakeland resident Glenn Monroe is the state tournament director and keeper of records for the Florida association. He says there are about 6,800 registered players from Estero to Sebring to St. Petersburg. But one place stands out as the focus of Florida shuffleboard. “If you were going to single out a hotbed of shuffleboard, it’s Zephyrhills,” Monroe says of the central Florida community. How does one become good enough, whether from Cape Coral or Zephyrhills, to qualify for the state tournament? “The key attribute like any other sport is concentration,” Monroe says, which is apparent watching shufflers study the court, size up shots and try determining what to do next, even two or three shots away. “Top players all have that laser focus,” Monroe adds. Cape Coral resident Ray Buck, 76, knows about that laser focus, playing minor-league baseball in the early 1960s, into shuffleboard since 2003. When he started playing at North Fort Myers Community Park into his 60s, his wife often asked the same question when he came home, he says. “Joan would say ‘What 90-year-old beat you today?’” Buck says, smiling, perhaps because he would finish second in the Clearwater tournament. Written by Glenn Miller of Fort Myers, a frequent contributor to TOTI Media.